Now let’s discuss the publishing ins and outs. Don’t forget to comment for the chance to win a signed copy of my novel! 1. When you first wrote and posted your novels as a series of stories on your website, did you ever think or imagine it would get so many devoted readers/fans/followers not too mention traffic on your old website and get them to be published? Ok, it's been a while since I've posted and updated more about this. So, here we go...time to bring this back! The first 40 were already posted about several months months ago. 5 More FAQ with Q&A are posted here. 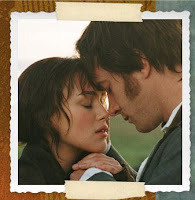 The current poll (#10) is now up (scroll down at the bottom) right side bar under the Weekly Poll for the new poll question:Besides Elizabeth & Darcy, which other P&P couple did you enjoy watching in the movie? Which one of the P&P Marriage Proposal scenes is your most favorite? A the very end of his acceptance speech, MichaelO'Connor mentioned and thanked Keira Knightley (and The Duchesscast), he said that Keira was a "one classy lady." I am honored and thrilled to be given this opportunity to talk about my debut novel! 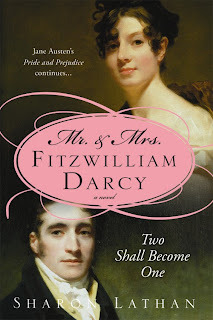 Mr. and Mrs. Fitzwilliam Darcy ~ Two Shall Become One is a romantic sequel detailing the initial honeymoon months of Darcy and Lizzy. This first in my Darcy Saga series is already available at Target, on Amazon and Barnes & Noble online, and occasionally even popping up on bookstore shelves despite not officially being released until March 1! 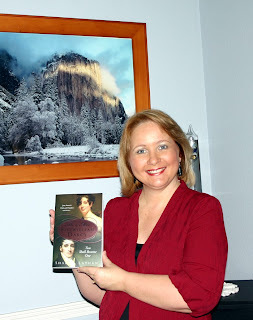 Jeane – blog owner and friend – has been wonderfully supportive of my efforts for years now. I owe her a tremendous debt of gratitude. 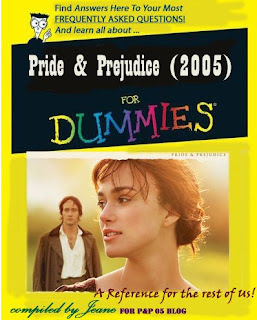 Of course, our shared love of Joe Wright’s 2005 adaptation ofPride & Prejudice bonded us instantly! Nevertheless, mutual admiration did not immediately mean she would love my sequel, yet thankfully she does. Nor is publicizing my book or freely giving me leave to hijack her website for 3 whole days required, yet she has! I can never fully repay, but will do my best by answering her questions honestly and with humor. An exclusive clip from An Educationstarring [former P&P co-stars] Carey Mulligan and Rosamund Pike has now surfaced online. You can view 3 more clips @ collider.com. Magazine scans: Keira Knightley's 10 Best Ever! Keira Knightley is featured in a two-page spread of the current InStyle Magazine's (with Sandra Bullock on the cover) March 2009 issue. On page 124, Keira's 10 Best Ever! looks are featured from 10 to #1 favorite! Got my copy of this magazine and quickly scanned them here for you all. She leads us on a red-carpet ride through looks alternately girlie sweet and glamorously edgy. "Keira wears things that are daring and spontaneous," say Rodarte's Kate and Laura Mulleavy. "She lives in the moment." We can't wait to see where she takes us next. Though she looked gorgeous in all of them ^, I personally loved Keira's look in the following: #10, 9, 7, 4, 2, and #1 (of course). What about you, what's your favorite Keira Knightley look from pics of her (that InStyle mag. provided above) 10 Best Ever! look? Post your thoughts and opinions in the comments section here. According to Ace Showbiz, Rosamund Pike is nominated for a Genie Award for Best SupportingActress in her film, Fugitive Pieces...while the movie itself scored 6 nominations. While "The Necessities of Life" took the most nominations, "Fugitive Pieces", the Samuel Goldwyn Films drama based on best-selling novel by Canadian poet Anne Michaels grabbed six nods. Some of the nominations the Jeremy Podeswa's film landed include bestsupporting actress and actor for Rosamund Pike and Rade Sherbedgia respectively, as well as best adapted screenplay for Podeswa. The nominations of the 29th Genie Awards were announced by veteran actor Gordon Pinsent and Quebec entertainer Caroline Neron on Tuesday, February 10. The awards ceremony itself will be held on April 4 at the Canada Aviation Museum. It will mark the first time the ceremony is being held outside of Toronto or Montreal. The complete list of the 29th Genie Awards nominees can be read at Genie Awards. You may have noticed the new changes to this blog upon visiting here today. I've just updated it with a new layout/look. I changed the main header banner ... and re-arranged the sidebar contents (in case, you didn't noticed, lol). What do you think of the new look/layout? Love it? Hate it? Feel free to post your thoughts/opinions in the comments section here. Any feedback from any of you (regular readers and visitors) is appreciated. Thanks again for visiting. Hope you have enjoyed reading all the P&P actors' news/articles previously posted here. Next, I've updated the Weekly Poll (as it hasn't been updated in so long...). The current poll (#9) is now up (scroll down at the bottom) right side bar under the Weekly Poll for the new poll question:Which one of the P&P Marriage Proposal scenes is your most favorite? Many thanks to all of you who voted in the last poll. Below is the result from last poll. Which of the following P&P actors do you think was the best Mr. Darcy? Be sure to watch the 2005 Pride & Prejudice movie today with your sweetheart (if you have one or even if you don't) to celebrate Valentines Day. Here are some romantic P&P fanmade music videos for you all to watch and enjoy! Whatever you do today... Enjoy and have a Happy Valentines Day! Matthew Macfadyen and wife/actress Keeley Hawes both attended the The British Academy of Film and Television Arts (BAFTA) awards, Feb. 9th, 2009. His film, Frost/Nixon was nominated for 6 BAFTA (as previously posted here: BAFTA Final Nominations: Frost/Nixon scored 6 and The Duchess gets 2 Nominations). Matthew was a presenter during the award show as well. He presented two awards for the evening, alongside actress Emily Moritmer. View more MM pics here at Sharon's Darcy Saga Portrait Gallery. Rosamund Pike was spotted at the Finch & Partners' Pre-BAFTA party at London's exclusive Annabel's nightclub Feb. 7th, 2009. Check out a few new pics of Rosamund Pike below! Keira Knightley and Carey Mulligan aren't the only P&P stars out and about in various events, parties, and awards shows these days, another P&P star Talulah Riley has been busy attending these various events herself. She attended the red carpet arrival/awards show and afterparty of The Elle Style Awards 2009 (Feb. 9th), Soho House Grey Goose After Party (Feb. 8th), The Orange British Academy Film Awards Nominees Party (Feb. 7th). Wow, Mary Bennet sure doesn't look plain... Talulah looked gorgeous in all these new pics of hers. Check out several new TR photos looking gorgeous and glamorous below! Carey Mulliganhas been busy attending film festivals these days. A month ago she attended the "The Greatest" - 2009 Sundance Film Festival Screening and"An Education" - 2009 Sundance Portrait Session. Now, she attended the photocall for An Education at the 59th Berlin Film Festival at the Grand Hyatt Hotel on February 10, 2009 in Berlin, Germany. Yesterday, she also attended the premiere and photo call of The Shooting Stars (Feb. 9th), The Messenger premiere (Feb. 9th), and The Soho House Grey Goose After Party (Feb. 8th). Check out several new photos of Carey at these various film festival events below!